[2010-2016] Moon was full here every night. 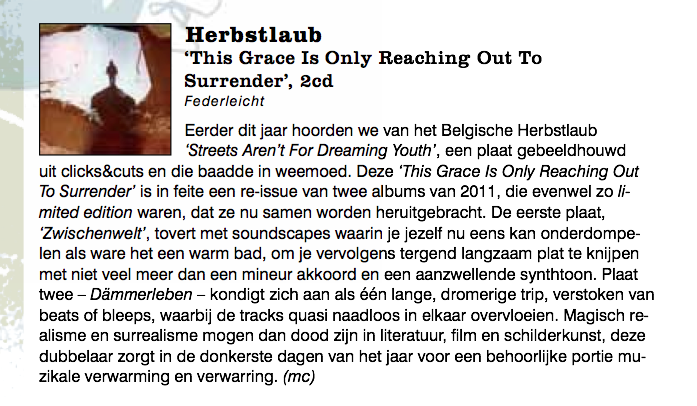 Federleicht was the Heimat of a Belgian ambient artist who worked under the monikers 'Herbstlaub' and 'die Nachtstunde'. Federleicht was intended as a platform to release this work on and as a central reference point to get in touch with these various releases. Music to continue what is lost. This Is Where We Sleep' is the collaboration between Michael Borgers, singer-guitarist from the Belgian Band 'The Isle of Men' and Herbstlaub. Michael: Vocals, guitar, the good ideas. Herbstlaub: Bassguitar, beats, programming, synths, minor vocals and others. First track 'Unknown' released on the Italian netlabel dtape: - December 2012.
sonnewende resembles both something of an eternal loss, as well as the concealed joy of continuous recollecting. From personare, literally 'sounding through', derives our use of the word 'personality' - which is actually close related to 'a mask'. Not that behind the mask is the true face. On the contrary, only a new mask. 'Per Sonare' is a synthesis of different sounds, different periods and therefore different 'masks' of herbstlaub and contains a divers chose of songs. Ranging from ambient, to more profound dance tracks, while others have been sustained with 'mantravoices' on them. Up to the listener to unmask this masquerade ((and find a new one)). Sold out. Until there will follow a repressing, you can download it for free below. Zwischenwelt is a collection of memories - which are for for me literally of interest; inter-est. It suggest to look at a memory as something in-between-being, inter-est, rather than in-being. A memory as something which pulls you outside yourself and places you inside the world. A memory not as an 'Innerwelt', something as a world-less residue or an island that we call 'subjectivity'. But an in-between-world throughout which you are already outside yourself, in music, is life, in being. SOLD OUT. 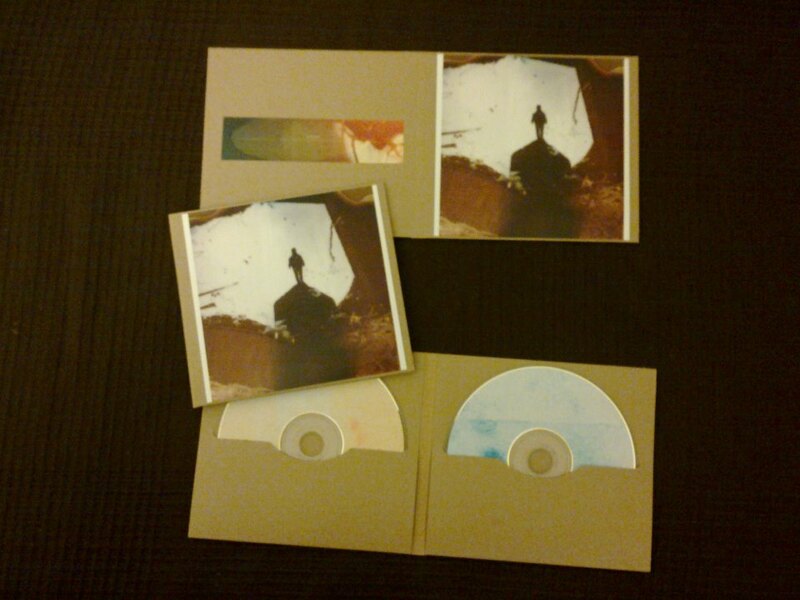 Limited CDr, hand-made artwork + a2 poster. Dämmerleben. Following the suggestion of some of these track titles, don't expect big rhythm changes, this is an ambient release. I won't be offended if you fall asleep on it. Actually, you can view it as an aesthetic accompany thereof. It's for those who have lonely nights. I'm there too. SOLD OUT. Limited edition of 18 hand-made copies. Picture on recycled carbon sleeve, wrapped in tracing paper. In 1922 Franz Kafka wrote to Milena Jesenská: "Mein Leben ist das Zögern vor der Geburt". 'Streets Aren't For Dreaming Youth' resembles that same hesitancy in a very subtle way. Fear and hesitation, admiration and awe into one breath, felt within one sound. In this album the cold sphere of indecision isn't just attached to the warmth of veneration but merged into a unified bliss. As a sublime synthesis of electronics and ambient, of dance elements and still enjoyable quite parts these tracks are somewhere in between the head and the hands. Remnants of sounds, remnants of things or remnants of things already be lost.. All things get lost, eventually. "Remnants" (2012) isn't an attempt to get grip on this matter, trying to give it a second life or as you can state alternatively: trying to get lost the loss. On the contrary, this release is at the heart of the things which pass constant through us, as every moment renews itself - to become: a new one; to become becoming and to lose itself again, in itself. To make this process tangible harmonious parts are alternated with broken sounds, occasionally sustained with deep, tremblings evoking baselines. Repetitive parts are intensified with pure sounds until they get larger and larger, to eventually cut through you and resulting in an explicitly awareness and feeling of this moment. Music as the phenomenology of loss -to get renewed and to become rigid again- because also music must stop; once. Hence the loss. Herbstlaub', a belgium ambient artist, sound can be described as warm, long stretched melancholic layers which resembles both something of an eternal loss as well the concealed joy of continuous recollecting. Normally he is somewhere inbetween the head and the hands, combining ambient spheres with intelligent beats, for example in his latest album 'The Streets Aren't For Dreaming Youth'. However for this release he totally disrobe himself of the beats and clicks to evoke a world which is dark, actually hardly to conceive a darker one, but pure at the same time. A world which is a witness of loss, and yet that you can experience over again in only 22 minutes. Mastering and packaging by David Ya. Released on Entropy Records, ED.005. Limited to 100 copies. Sold out. 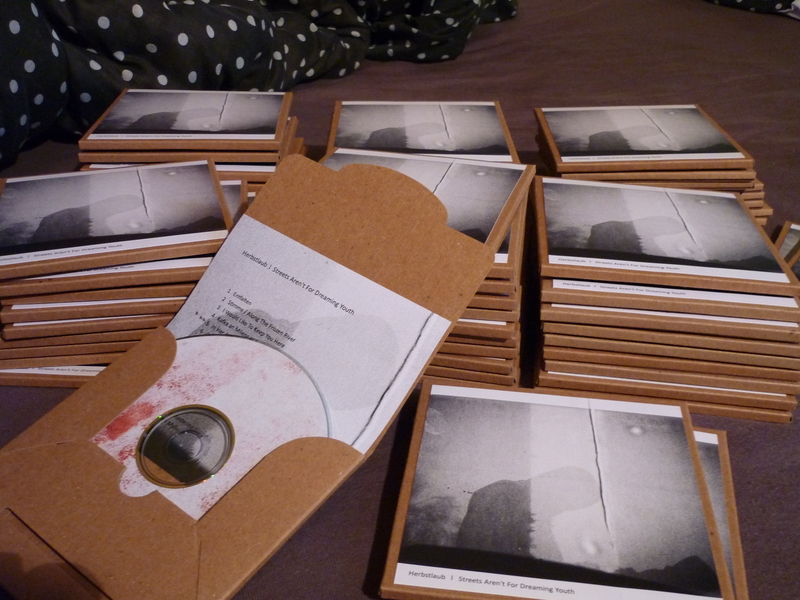 Re-edition on 100 pieces of the album Zwischenwelt (2011) and Dämmerleben (2011) together with bonus material and unreleased tracks. In total more than 130 minutes of Herbstlaub music. Interstellar Sounds (UK, Europe) > "Sold Out"
On Our Love Was Only Half Forgotten Herbstlaub continues his path of singing in an hitherto unknown language, whispering sighing mantra's that spin around the head and attempt narrating unnarrated stories - stories that were hidden, concealed under a language that never existed. Although this voice that isn't singing and neither merely sighing gives the album a slightly dark touch and atmosphere, as if night would lay his cold hands in your neck, the subtle use of filters accompanied with the typical herbstlaub guitars, under a sea of warm and reverberating electronics, still gives the album a wholehearted and gentle fullness. As minimal parts are being sustained by spinning guitars and almost dancing synths, glitches and high frequencies accompany a very spacious and reverberating sound. This album, even more than its herald Streets Aren't For Dreaming Youth, is definitely somewhere between head and hands. ‘Hauch’ [de]: whispering breath, as a gentle, almost forgotten breeze. As a ‘Hauch’ the music lays its fingers on its listeners and starts unfolding. Gradually one notices slight changes in the current of the air. Mist draws back and comes forth again, beats which never really become beats move in different directions while Herbstlaubs singing, which never is merely singing, changes colours and creates new layers over various elements of guitar, warm electronics, diverse effects and subtle filters. The more Herbstlaubs breath strokes us, the more Hauch stretches out, the more we notice how much remains unsaid. This LP is a careful selection of earlier work, enriched by a new track and is the first vinyl release of Herbstlaub' music. Notice that this 12" is only a ‘Hauch’ (a hint) of this broader musical work. The track 'Auf einen Stern zugehen, nur dieses' was made in 2011 and released on Per Sonare. The track ‘Plenilune’, taking from the album 'Our Love Was Only Half Forgotten' seems to refer directly to this broader work. So besides a full LP, one could listen to it as an introduction to the project federleicht.be and an anticipation of the releases, that still have to come. This music is a lightpad - as sound. Mastering by Rashad Becker, Dubplates&Mastering, Berlin. Herbstlaub isn't an artist. Herbstlaub is a melody. There are many unreleased melodies of a kaleidoscopic past, which isn't one. This is just one of them. The continuation is yours. Throughout the last five years I always felt that in the tracks, sketches and ideas that I haven't released, the most is being touched what Herbstlaub could be. That may uphold why I enjoy the tension which is in between two releases the most, it also clarifies why I consider Herbstlaub as »melōidía«, singing, chanting motion which is perceived as an entity, instead of being that entity. Retrospects always tend to aweigh presence. Older songs in order to allow present tracks. Before publishing my latest album 'Seems Like Time To Remember, Seems Like The Moment To Forget' I felt drawn towards some unreleased tracks, which resemble more instrumental chanting and restless layers of Herbstlaub. 'New Insight From Forgotten Clouds / Forgotten Hints From New Memories' anticipates the newest album that will be much more drifting and electronic just because this one takes back beats and energy. FDL-V#One, available on vinyl only. Mastering by A.P. at GS Mastering & Post. Electronics somewhere between beauty and presence, between a breath of air and a dance, still undanced. Hesitating beats as a careful puzzle, the sigh of a piano mesmerizing in time, remembered, black and white instrumentals dancing cheek to cheek with electronics in colour, this music moves to stagnate in only a moment, only a memory. On his tenth album, Herbstlaub shows himself in his most electronic semblance. Sometimes energetic, as blessed with too much life, sometimes with the peculiarity of a melancholy like there was no meaning. With an integrity, sensed, but far from being possessed, Herbstlaub's typical musical motion drifts in a tree-like sway. Its motion comes inevitably as the tree from the root, the branch from the trunk, the blossom from the twig. 'Seems Like Time To Remember, Seems Like The Moment To Forget' evokes that fragile beauty between memory and moment, a consciousness between two eras, in between the poetry of the past and presence in the rise and fall in their intensity. A moment to forget, a brief calmness, mantraesque synths and intrinsic restlessness in full colour. FDL-V#Two, FDL#04 - available on vinyl and CD. 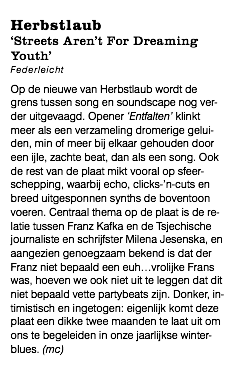 Review in dutch by Damusic. Somewhere between the head and the hands is the heart. Die nachtstunde is a collision of ambient structures and minimal discourse with some dubby influences and is the more profound electronic outcome of herbstlaub. Still Herbstlaub and die nachtstunde are on the same road - but 'ventured in reverse'. Dreifarbenwelt is a collection of tracks written between November 2011 and September 2012. As the album's title suggest ("Three-Colour-World"), the album works by creating tracks built from the same basic ingredients and a limited set of instruments and samples, attempting from the outset to combine these constituent parts in such a way as to expand certain nuances in their inherent spectrum of colour and shade. Noises and elements are mostly subtle, emerging just enough to evoke a specific spatial, though not fully identifiable, dimension, with the underlying deep dub basses serving as a grounding to create a tangible, worldly-rooted atmosphere. Released on Entropy Records (fr). November 2013. Flüstern macht gemeinsam. Whispering makes mutual. As a whisper, only a whisper, try to speak. The sudden change of air, mood and surrounding, as you notice only the whispering, it whispers. You may imagine languages that only speak, as they whisper. You may imagine kingdoms that only prevail, as it whispers. Maybe there is a rain, that whispers. And it whispers. Available on CD, 150 copies. Exist without presenting. Expose without existing. ‘Seems Like Time To Remember, Seems Like The Moment To Forget’ was planned to be my last album, until a good friend of mine asked me to make accompanying music for an exhibition. Some picked up ideas from an unreleased beatless album in 2015, together with new tracks have been performed on 2th April 2016 at 'Huiswerk', Antwerp. Sketches of the acclaimed Belgian illustrator Ingrid Godon were being accompanied by this snowflake-alike Herbstlaub music. This album is for my grandmother, whose image is included in the album inlay. Mastered by A.P. April 2016. Musikmussmit did a German interview about my music, name-giving und das unmögliche Verborgene, was sich »zwischen« den Releases abspielt und man nie zeigen kann. Podcast for Italian electronic music magazine. For the Belgian collective La Lluvia I made a more 'dance' session under the moniker of Fehlleistungen. Ipad release of Zona, a photography book on russian work camps by Magnum photographer Carl De Keyzer. I made the audio and accompanied music. Track is a reworked version of the song 'mellemhverandre' from my first album Sonnewende (2010). Concept and realisation by Little Miss Robot. Herbstlaub (live) @ Soireé Urthonà. w/ Aus (jp) - livingroom, Ghent (be). La Lluvia @ Meadownight, Brecht (be). w/ Microphonics (Dirk Serries), Oude Pastorij, Westmalle (be).